In everyday life, it tends to be used as an umbrella term for various weight loss obstacles. This usage is not exactly scientifically accurate – but it does describe a real problem. Some people lose weight quickly and easily. Others struggle with every small step. Why is that? And what can you do about it, if you happen to be one of the unlucky ones? 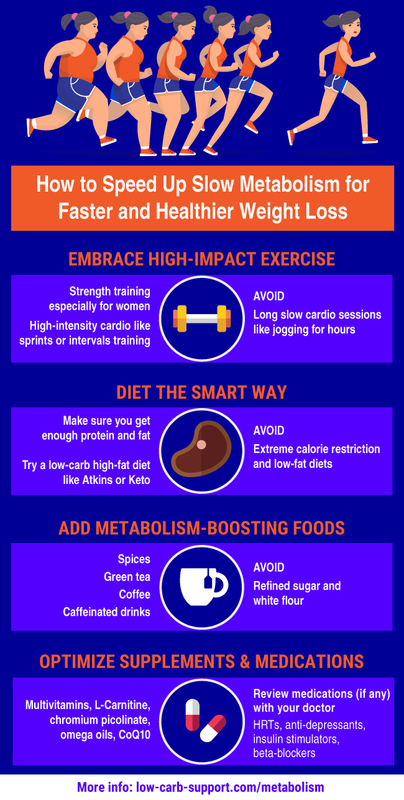 In this article, we are going to look at realistic ways to speed up your metabolism, for better health and faster weight loss. Metabolism is a complex process, which enables your body to process and use up nutrients from food. Everything you eat gets either converted to energy for your body’s activities, or turned into building blocks for tissues (muscle, fat, bones, skin, and inner organs). In layman terms, slow metabolism usually means that your body prefers to conserve energy rather than to spend it. Excess calories convert to body fat at lightning speed. Trying to shed this stored fat is excruciating. People who are blessed with fast metabolism don’t store body fat as easily. They can slim down quickly if they decide, which is infuriating really nice for them. One way to measure metabolism is the basal metabolic rate (BMR). BMR is the number of calories you burn per day, without doing any extra activity. These calories power your body’s basic functions like pumping blood and breathing. BMR is the calories you would burn up if you simply stayed in bed all day. Age. Metabolism slows down with age. Young people tend to have faster metabolisms. Generally, it starts to slow down from your thirties onwards – unless you do something to counteract this natural decline. Gender. Men have faster metabolism than women, because of differences in body composition and hormonal balance. Activity levels. Do you work behind the desk, drive to work, and spend your leisure hours in front of a TV or a computer? If so, your metabolism is likely to be slower compared to someone with a more active lifestyle. Extreme dieting. Drastic and sudden drops in your calorie intake can scare your body into a panic mode. It will hold on to its fat reserves even harder. So extreme calorie restriction may lead to slower metabolism, making weight loss harder. Many women fall into this unfortunate trap. Too much aerobic exercise. Another trap is trying to lose weight through jogging or a similar low-intensity cardio exercise. This can have an effect similar to strict dieting. Lack of sleep. Chronic lack of sleep may also prompt your body to conserve energy and hold on to its fat reserves. Body frame. People with bigger bodies burn more calories because more energy is required for maintenance and movement. Body composition. Your body spends more calories on maintaining muscle than other types of tissue. The more muscles you have, the more calories you burn, even during rest. Genetics and hormonal balance also play an important role, but in more complicated ways – there are no simple rules of thumb to estimate how these factors might affect you. What does this mean for you and your weight loss? There is nothing you can do about fixed factors like your age, gender or genetics. But you CAN make changes to your lifestyle that would help to boost your metabolism. And that’s great news! You can counteract factors that slow your metabolism with the right combination of exercise, nutrition and supplements. Without a doubt, the single best way to boost your metabolism is strength training. Unlike the never-ending debates about the best diet, there is a definite consensus regarding anaerobic exercise. Experts agree that we all need it, whether trying to lose weight or not. Strength training is the only way to grow muscle, which will, in turn, increase your basal metabolic rate. It has other significant benefits too – for example, stronger bones, lower risk of injuries and improved mobility. You don’t have to spend much money or join the gym to get started. You can strength train at home with minimal equipment, or just with your own bodyweight. Some women worry that doing weights will make them “bulky”. That’s a complete 100% myth – and a very dangerous one, as it puts off women who need it most from trying it out. Female bodybuilders are bulky because of testosterone injections and steroids. It is impossible for an average woman to grow those scary bulging muscles naturally, even if you were to spend hours at the gym every day. Strength training will make you look slimmer and more toned. You will look better even if you still have excess body fat. As you grow stronger, shedding those extra unwanted pounds will become easier and easier. Great book for beginners, with detailed descriptions of exercises, flexible programmes and lots of important tips and advice! Another persistent myth is that low-intensity cardio is a good way to lose weight. People spend hours slowly pounding the pavements, hoping to burn extra calories. Sadly, this can do more harm than good. Long sessions of low-intensity exercise can have the same effect as sudden calorie restriction – your body just goes into energy conservation mode. Cardio is not essential for weight loss. If you do strength training and follow a sensible diet, you can ditch it. If you enjoy running, opt for shorter periods of higher-intensity exercise like sprints or interval training. This will have a better effect on your metabolism than excruciatingly long slow jogs. If you are reading this website, you are probably already on a low-carb diet or thinking about it. That’s good news for your metabolism! The “low-carb vs low-fat” debate still rages on, so I am sure plenty of people would disagree. But there are scientific studies – as well as plenty of anecdotal evidence – that low-carb high-fat diets are safer for your metabolism than calorie restriction or low-fat diets. High amounts of fat consumed on LCHF diet seem to reassure your body that there is no starvation situation. So you can shed pounds without your body going into panic mode. High amounts of fat and protein fill you up faster and reduce hunger, so you are less likely to feel ravenous between meals. According to Dr Atkins, certain prescription medications can affect your metabolism. His list included hormone replacement therapies, anti-depressants, insulin stimulators, anti-arthritis medications, and beta-blockers. If you are on any such medications and struggling to lose weight, discuss the issue with your doctor. They might be able to adjust your medications or prescribe additional supplements to reduce its metabolic impact. When on medications, you should also discuss your weight loss plans (diet and exercise) with your doctor, or another qualified health professional. Combining strength training and LCHF diet will give your metabolism a solid boost. You can make a few further improvements through supplements and metabolism-boosting superfoods. But please note these are like the cherry on the cake – not the cake itself (please excuse the high-carb metaphor). They might give you a small further advantage, but nothing like as fundamental as strength training. Green tea has a stellar reputation, which for once is fully deserved. It helps to boost fat-burning metabolism and regulates blood glucose, which can, in turn, reduce sugar cravings. It is also a great antioxidant and a source of caffeine. For a more concentrated version, try Japanese matcha powder. If you don’t like the taste of green tea, get green tea extract as a supplement. If you don’t like spicy food, most of these are also available as capsules. Caffeine gives you an energy boost and can help to speed up metabolism. Caffeinated drinks are an obvious and popular choice, but caffeine supplements are also available. Multivitamins help to cover any potential gaps in your nutrient intake, especially if you are on a very low-carb diet. Lack of essential vitamins or minerals can have a negative effect on your metabolism. A daily multivitamin is a simple insurance policy against that. Additional supplements that may have a positive effect on your metabolism are chromium picolinate, L-Carnitine, Omega oils and Co-Enzyme Q10. Ideally, discuss supplementation with your doctor or another healthcare professional to choose the combination of supplements that’s right for you individually. As we grow older and less active, our metabolism slows down, making weight loss harder and harder. But you can reverse this process through strength training and smart nutritional choices. Start now and beat the clock!